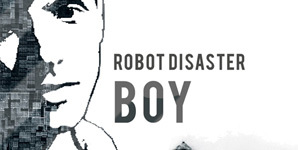 Robot Disaster release the single Boy on December 7th through Gash Digital. The track has been chosen by Kissy Sell Out as one of the lead tracks to play on his upcoming radio one show. Boy was produced by Sean Genockey who's recently worked with Baddies and Manic Street Preachers. The single package comes with a remix package featuring versions from Heads We Dance, G.e.R.M and Punx Soundcheck.